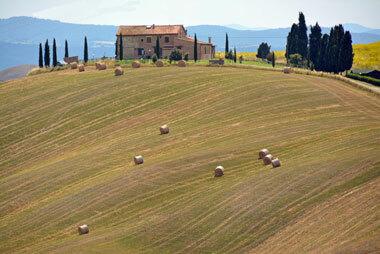 Tuscany Holiday Houses offers different holiday accommodations for your vacations in the provinces of tuscany. We offer you nice tuscany apartments and villas with self catering for rent. Also we can arrange for you rental hotel rooms, with or without bed and breakfast, wine tours and farm holidays in beautiful tuscany farmhouses away from the mass tourism. Toskana-Pur mediated over 10 years rentals, vacation homes and holiday rooms. Already the word TUSCANY makes the heart beat faster, creates images of colorful landscapes, cypress- and pine avenues, Mediterranean food and deeply red Chianti, enjoying the warm summer nights with cicada songs. The unique charm of this region of Italy, whether landscape, culinary, culturally or historically, no one can escape! Your holidays in Tuscany will enchant you and leave unforgettable impressions. Toskana-Pur mediated over 10 years rentals, vacation homes and holiday accommodations in Tuscany, Umbria and Sicily, a contract is formed through our agency with the respective owners. We will accompany you on your journey through Tuscany and also find accommodation away from the mass tourism, in which you may enjoy your vacation and really relax. Whether by the sea side or country side, whether romantic medieval mill, farm holidays in Tuscany, typical natural stone cottage, cottage on Elba, apartment in the countryside or in the city, or rustic Agriturismo, Bed & Breakfast - we mediate the right holiday home for each family, even with children. You want horseback riding vacation, mountain biking or play golf? And your dog as a faithful companion should stay with you? Then you are right! Welcome to TUSCANY HOLIDAY HOUSES, your provider for holiday homes in Tuscany, Elba, Umbria and Sicily. The medieval romantic mill in Vinci, as well as the local natural stone cottage, the apartment in the countryside or in the city, or the rustic farm holidays in Tuscany, Bed & Breakfast accommodation. We surely have the right holiday accommodation for you at every holiday’s season. Let us expert advice and book online your dream home. We reserve your apartment in Tuscany, one of the most beautiful regions of Italy, in any desired size and amenities! Of course, we will find a wonderful holiday home for you. Many vacation houses, villas, farms are waiting for you in Tuscany, Elba, in Umbria and Sicily. Many cottages are equipped with a pool. Stylish villas, exclusive villas and rustic farmhouses in the best regions of Italy will ensure that you have a memorable pleasant holiday. The Tuscany chocolate is not only one of the world's best chocolate, but the cafes have also a wide range of ice cream and pastries. Enjoy the old towns in the picturesque atmosphere with a cup of espresso or cappuccino. Enjoy the nature, the good food, delicious wine, the culture, art and beauty of this country. Perhaps, coziness and hospitality are on the top of your list? Then you are cordially welcome in Tuscany. Viticulture and Agriculture in Tuscany play a very big role. Many farms, stylish villas, exclusive villas and rustic peasant houses in the best areas of Tuscany offer apartments or houses for holidays overnight. The hospitality of the families will ensure that you have a memorable pleasant holiday. Ask for our Agriturismo Tuscany offers. The best-known attractions of Tuscany are probably Florence, Pisa, Lucca and Siena, but also Massa Marittima, Bolgheri, Livorno, Chiusi, Arezzo, Pitigliano, San Gimignano, and many more are necessarily worth a visit. Who wants to visit all cultural objects in Tuscany either has a lot of time or is already planning the next stay. Who also in Tuscany will be active - no matter whether golf, mountain biking, horseback riding, hiking, trekking, skiing or sailing - Tuscany offers something for everyone. For the wellness there are many spas in Tuscany.